Immediately gripping and thoroughly harrowing, Storming Las Vegas tells the story of a remarkable true-life crime spree—a story that was previously squashed so as not to disturb tourism—that ultimately proves the saying "what happens in Vegas stays in Vegas." 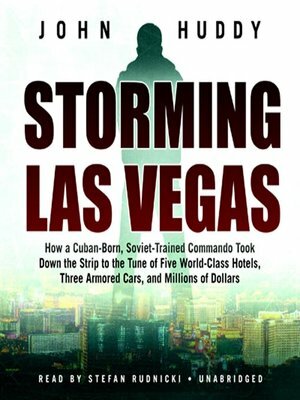 On September 20, 1998, a Cuban-born former Red Army lieutenant named Jose Vigoa launched a series of raids on the Las Vegas Strip. During a sixteen-month spree, Vigoa hit five world-class hotels, three armored cars, and one department store. The MGM, the Desert Inn, New York, New York, Mandalay Bay, and the Bellagio were the casinos involved. Lieutenant John Alamshaw, a twenty-three-year veteran in charge of robbery detectives, was ordered to stop the robberies at all costs. He knew he was up against a mastermind—what he didn't know was that he was running out of time. John Huddy is a veteran journalist and producer.